Company Eknis implements turnkey supervisory control (SC) systems for 6-750 kV electrical substations, as well as for their own needs, for electrical power systems of industrial enterprises. SCADA systems are made on the basis of MicroSCADA by ABB with switching devices control through microprocessor relay protection units by both foreign and domestic producers. Present level of development of relay protection microprocessor units allows combining a number of functions in a single device, previously performed by adjacent systems. 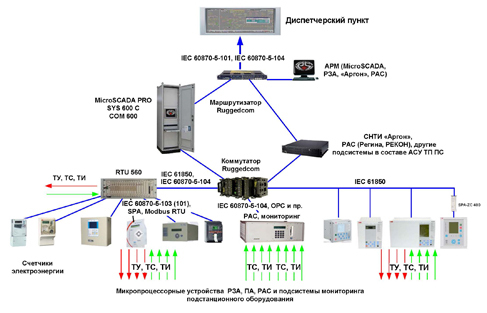 So, current relay protection devices allow implementing not only a number of protecting functions but also connecting switching devices’ control automation, measurement, emergency and faulting location recording, telemechanics and connections through standard digital communication protocols with a gateway level or substation automation server. • Automated workplaces of relay protection engineers enable remote settings change, emergency processes and protection work analysis based on waveforms, recorded electrical values and events information. Server SCADA is based on MicroSCADA technical servers. It is also possible to use SYS600C technical servers by ABB depending on the amount of information. SCADA’s technological LAN is based on secure technical switching equipment by RuggedCom (Canada). It is possible to implement wireless links based on WiMAX technology. System equipment time synchronization by GPS is based on equipment by Meinberg (Germany). • automated monitoring of power equipment. The data listed above allows to mark out the MicroSCADA system for operational control implementation. • Emergency cases recording system server and electricity quality control system center. In case extended registration is required we offer an integration of emergency cases recording systems by domestic and foreign manufacturers: REKON, Regina, as well as technological measurement systems based on SATEC (Israel). SCADA systems can include subsystems of local data collecting and processing or electrical meters for technical recording.